From my brief time playing hockey in Washington State, I remember seeing Mount Rainier dominating the skyline on drives to games and practices. Anywhere I went in that state, she stood fixed, constant. In wine, another “mountain” reigns supreme—on the eastern half of that state, Red Mountain, produces structured Bordeaux blends and Rhone varietals. Recently given a sample of 2010 Hedges Family Estate Red Mountain wine, I was encouraged to revisit my other favorite State… sans pucks. The Red Mountain AVA of Washington State sits on the eastern border of the Yakima Valley AVA, where grapes ripen on steep slopes of sandy loam. Unlike the western side of the state where I resided, Red Mountain AVA gets plenty of sun and a miniscule average of six to eight inches of rain per year, which allows the predominant varietals of Cabernet Sauvignon, Merlot and Syrah, among others, to ripen perfectly. I poured a glass of the Hedges Red, a blend of Cabernet Sauvignon, Cabernet Franc, Merlot, Malbec and Syrah, which painted the inside of my stemware a deep purple core with ruby highlights. The bouquet was aromatic (medium-plus intensity) showing a developing and hearty cocktail of dark cherry, blueberry, tobacco, coffee grounds and leather. On the palate, the medium, fine-grained tannins lent structure, and the medium body was filled out with the rugged flavors found in the perfume in a long and smooth finish. The red wine showed exceptionally well, it convincingly married those earthy flavors found in Bordeaux with balanced New World fruit. Red Mountain might not actually be a mountain, like Rainier, but it’s a distinct and reputable wine-producing region and for good reason, as it begins to dominate the Washington wine landscape. 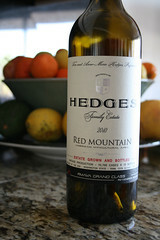 Hedges Family Estate is a recommended buy!